Here's a rare vintage bass that I lucked into online several years ago. It was Gibson’s answer to the first Fender Precision bass. 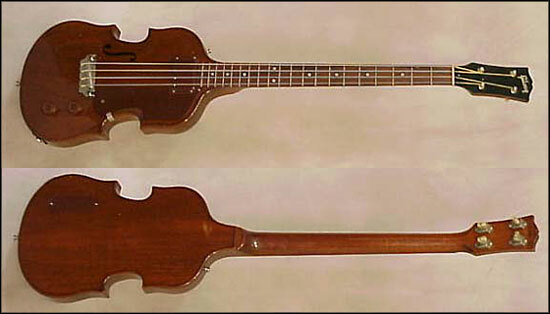 After some research, I discovered that this particular instrument is one of the earliest EB-1 basses Gibson ever made. Felix Pappalardi, of Mountain fame, popularized this model back in 1970. John Paul Jones posed with one on the rotating inset sleeve of Led Zeppelin III. More recently, Jack Bruce played a 1969 model for the Cream reunion. The EB-1 (“Electric Bass 1, clever title, no?) features a violin shaped solid mahogany body, glued-on short scale neck and banjo style tuning keys. Its single pickup, mounted at the end of the neck produces the dubbiest bass sound you ever heard. Stand too close to your amp whilst playing this baby and it'll make your colon feel funny. As I mentioned earlier, Leo Fender created the first Fender Precision electric bass back in 1951. At that time, the public didn't know what to make of electric basses. Everyone was used to seeing upright acoustics. In response to Fender's release of the first P-basses, Gibson came out with the EB-1 in late '52- early '53. (depending on who you ask) The first models, such as this one, didn't have serial numbers. According to my sources, Gibson began imprinting these basses with the now standard behind-the-headstock serial numbers in late 1953. They stopped production of the EB-1 in the late 50's and resumed production for a short time from 1970 to 1972, no doubt in response to the high profile created for it by Felix Pappalardi. If you're interested in more info about this bass, be sure to check out www.pappalardi.com, a website run by Bob Schatzle, a fellow bassist and an avid fan of Mountain. It is dedicated to Felix' memory and contains lots of EB-1 photos. Also, you might want to read Doug Lubahn’s new book, entitled “My Days With The Doors” (www.douglubahn.com), where he describes using his EB-1 in the studio with the Doors. Although the Doors didn’t appear live with a bassist, they frequently recorded with one. Talk about great road stories! No matter what kind of acoustic upright bass you have, it will sound better after you take it to David Gage's shop in NYC. Even if it just sits in the corner for a week and absorbs some of the ambience, it will sound like a more expensive instrument. Hear this bass in action on the tune "Intimate Strangers, from the CD "Intimate Strangers." Click here to zoom in on the Bridge, and Click here to zoom in on the Headstock. Okay, if I never do anything else, I can still die happy after creating this bass. 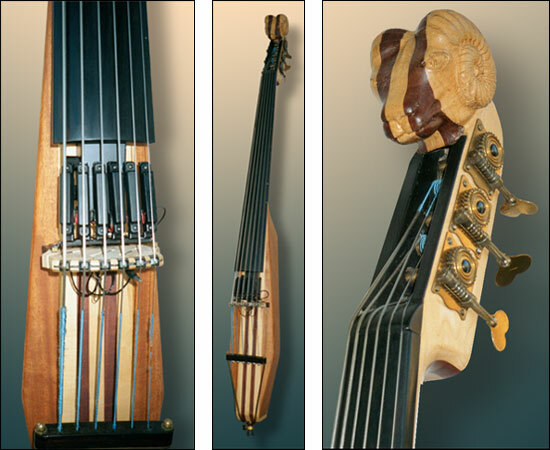 Back in 1985, I took the idea of building a prototype upright electric bass to my friend and luthier, Doug Montgomery, who builds and repairs guitars and basses at The Guitar Factory in Orlando, Florida. Doug had worked with Michael Tobias prior to Michael's departure to California to start his now famous line of basses. I had played some of the upright electrics available at the time, but I just wasn't impressed with any of them. They were portable, but lacked character. After kicking around the idea of building a five string, Doug suggested that we go all the way and build a six string instead. "A SIX string upright bass! ", I thought. "How cool is that?" Then I went home and drew a pencil sketch of what I thought the bass should look like. I wanted to keep the scale length the same as an acoustic upright, so as not to compromise string vibration. I measured the string and bridge angles on my own upright, so that the string pressure would be consistent. I knew that I'd want to optimize this bass for soloing, so I streamlined the body for easy neck access. I also wanted to incorporate some really cool design for the headstock. I'd always admired the gothic style lions head on the headstocks of old European uprights, but I didn't want to copy their idea. Hmm. A couple of days later I went back to see Doug and show him my sketches. We discussed the headstock concept. We both agreed that a plain, boring headstock wouldn't do this bass justice. But what should we do? There were a few other customers in the shop and we all started discussing design possibilities. The idea of a cobra head surfaced. Nah, it would be too fragile, and might break off too easily if dropped. Someone even suggested Porky Pig, but I thought I should save that idea for another bass... Then we hit on it. A Ram's head! With big spiralling horns like a scrolled headstock. And it should look sinister, with snake eyes! Voila! We added that design to the sketch and the whole thing came together. Hear this bass in action on the tune "I'm More Than That," from the CD "Intimate Strangers."